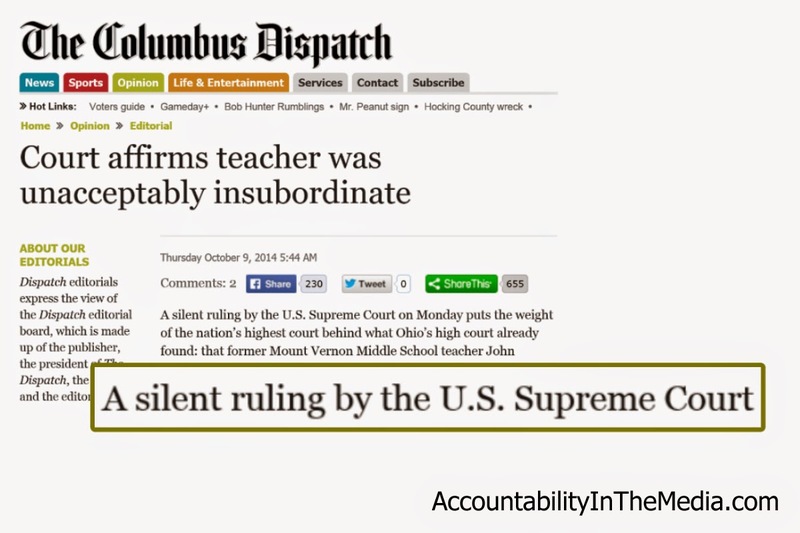 This is a response to The Columbus Dispatch editorial of October 9, 2014, titled "Court affirms teacher was unacceptably insubordinate." The Dispatch claims that the U.S. Supreme Court has issued a "silent ruling" on Freshwater v. Mt. Vernon City School Dist. Bd. Of Edn. putting its "weight" behind the majority opinion of the Ohio Supreme Court. Nothing could be further from the truth (except maybe another Dispatch editorial). The U.S. Supreme Court did not affirm, uphold, or in any way put its weight behind the firing of teacher John Freshwater. 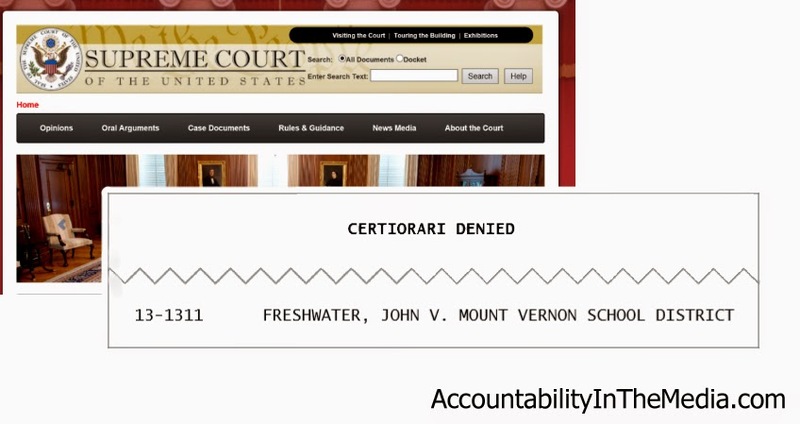 The court merely denied Freshwater's appeal or petition for certiorari. The Dispatch says the state court ruling found "that Freshwater showed 'blatant insubordination' by refusing to remove religious texts, posters and other items from his room." About this the Dispatch does note, "That's a narrow legal justification for removing Freshwater from the classroom." The justification becomes even more narrow when you consider that the "religious" items were two library books and a poster of George W. Bush. It becomes narrower still when you factor in that the teacher says he didn't even know the school wanted those items removed. The Dispatch goes on to say "but the more-important issue is that Freshwater’s insistence on inserting his Christian beliefs into his teaching of science was grossly improper and short-changed students. He questioned the theory of evolution — the foundation of modern biological science — and suggested that the faith-based idea of creationism is a valid alternative." He QUESTIONED the theory of evolution! It's almost as if he believed that "the freedom to speak and share ideas is an inherent precept of a democratic society governed by the will of the majority." And that "teachers and students need to be free to discuss and debate ideas." Oh, wait. That's word-for-word the official policy of the Mount Vernon Board of Education. The Dispatch is firing at the wrong target. And what's this about students being "short-changed"? In what way? The students didn't give the impression that they felt their educational experience was lacking when they rallied in support of Freshwater in the spring of 2008. Neither did they give that impression when they testified about their science teacher during the state administrative hearing. In fact, the hearing referee, R. Lee Shepherd, wrote, "Many, possibly most of his students seemed to enjoy his class and remember it fondly." Perhaps the Dispatch has in mind the test scores of Freshwater's students. Let's take a look at what Shepherd wrote about that. Perhaps it will be scathing: "On the average, Freshwater students performed at or above the state requirements and expectations for eighth grade science students. The state test score results for his students often exceeded the state test score results of other eighth grade science teachers." So, the tests, the scientific way of knowing how his students performed, show that they performed quite well. Apparently the stars just weren’t aligned the way the Dispatch wanted. The Dispatch's concluding paragraph contains the statement, "It’s wrong for a public-school teacher to use his position to proselytize on behalf of his faith." And by "proselytize" the Dispatch simply means being a red-blooded American. The First Amendment doesn't ban the consideration of various sides of controversial issues. The written policies of the school board don't ban such consideration. Neither is inclusion of religion banned. The school board's policy states, "Instructional activities shall not be permitted to advance or inhibit any particular religion." And "students should receive unbiased instruction." The Dispatch wants to accomplish those objectives by banning consideration of all but one viewpoint.